AS A LIFE-LONG LUTHERAN, I’m mostly unfamiliar with patron saints of the Catholic church, even though my husband, now Lutheran, grew up Catholic. 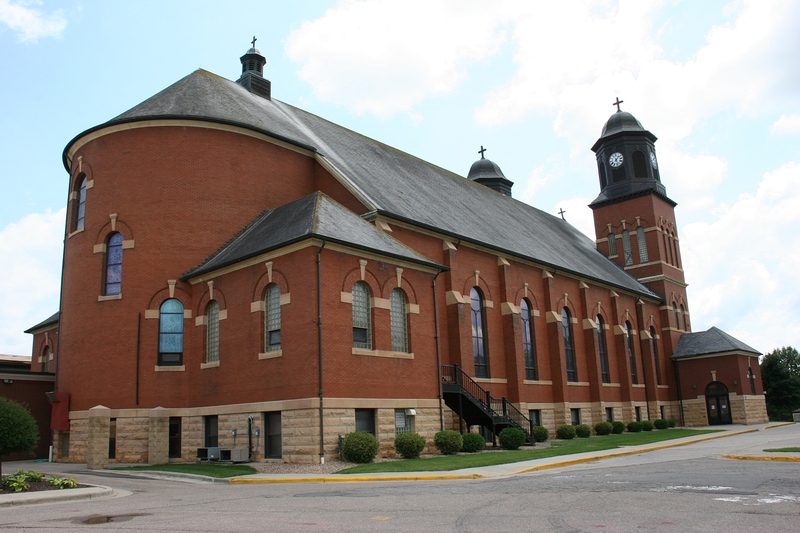 The Church of St. Wenceslaus, New Prague, Minnesota. 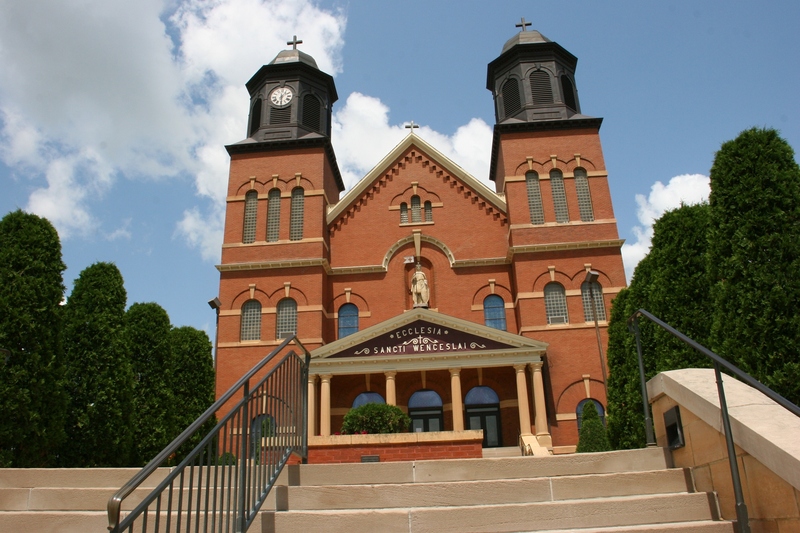 So when I happened upon the majestic Church of St. Wenceslaus rising above the east end of New Prague’s Main Street, I had to research the saint whose carved image guards the impressive columned front entry. 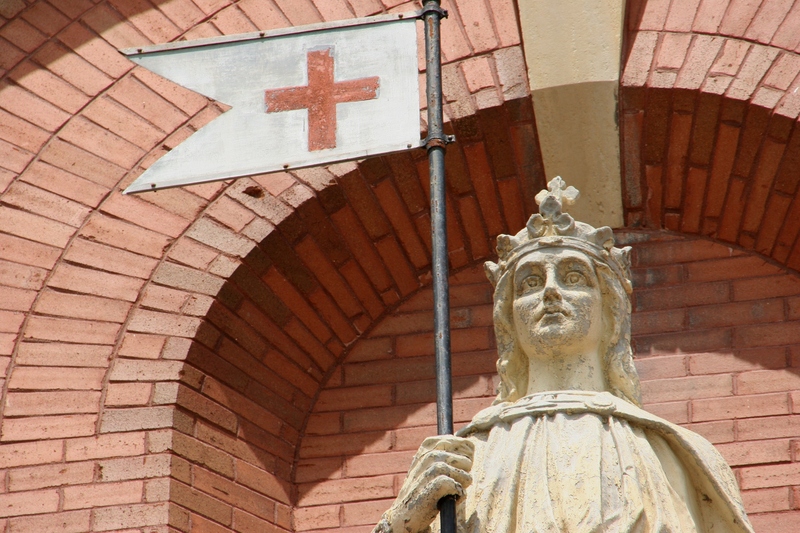 A close-up of the St. Wenceslaus statue above the main church entry. St. Wenceslaus, duke of Bohemia from 921 until his murder in 935, is considered a martyr for the faith and is hailed as the patron of the Bohemian people and the former Czechoslavakia. A side and rear view of this stunning church. 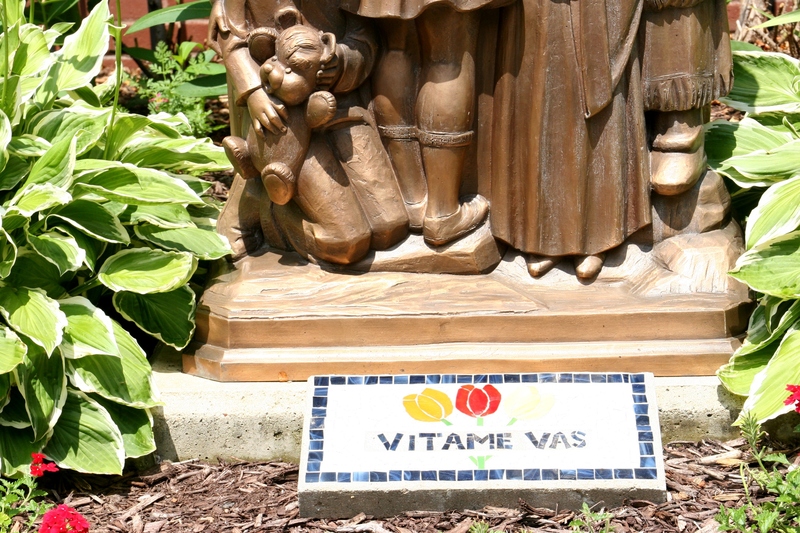 The selection of this saint for the New Prague congregation is fitting for a community with strong Czech roots. Founded in 1856, the Church of St. Wenceslaus is the oldest Czech church in Minnesota. 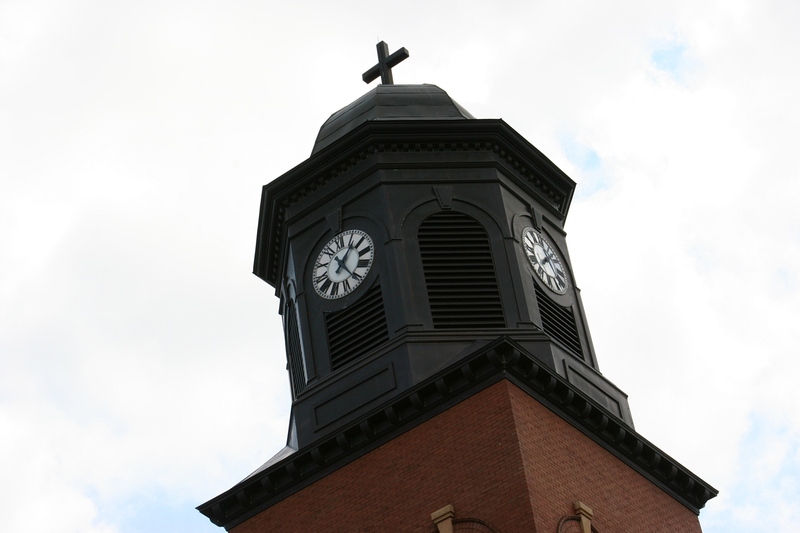 It is now part of the New Prague Area Catholic Community. 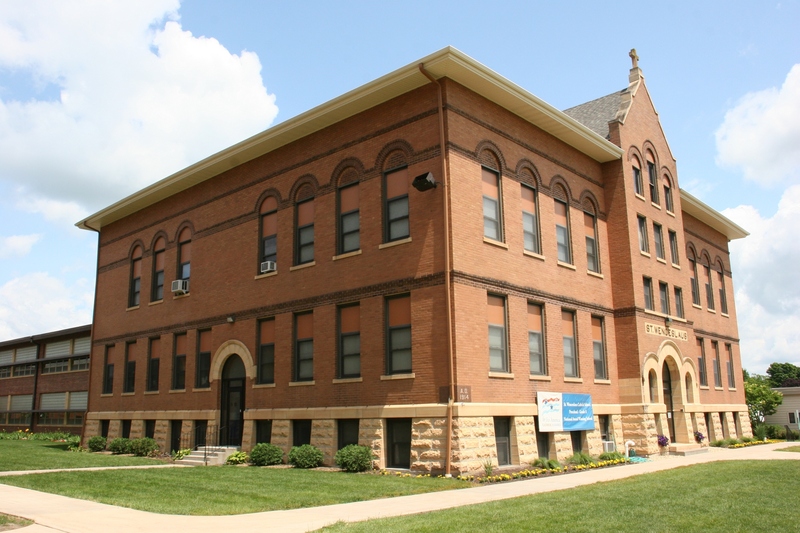 This is the old section of St. Wenceslaus Catholic School, built in 1914 and located next to the church. An addition was built in 2003. Students from kindergarten through eighth grades attend. The parish also includes a school opened in 1878. The church features two towers. This duo towered brick church is stunningly beautiful. I paused numerous times while photographing the exterior simply to admire its artful construction. Churches aren’t built like this any more. 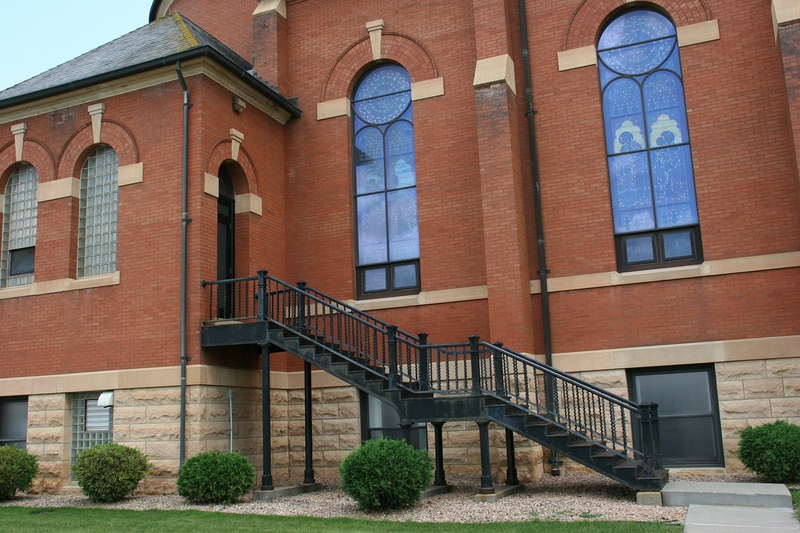 Even the side stairs are artful and the entire church exterior well-maintained. My single regret was finding the doors locked on a Sunday afternoon. This was not unexpected; most sanctuaries are locked now days. I could only imagine the lovely stained glass windows I would find inside, along with more statues of patron saints and worn pews. 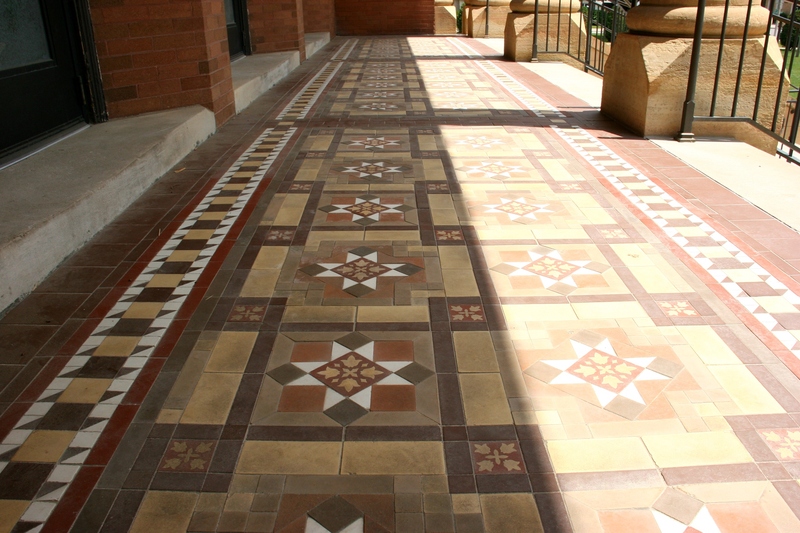 In sunlight (right) and in shade, the exterior tile floor under the columned entry impresses. Being Lutheran, I am intrigued by aged Catholic churches which are often significantly embellished with ornate details and religious art. This is so unlike most Lutheran churches. I appreciate both, wherein I find solace and peace. And perhaps that is the reason I seek out churches to photograph. Photographing them connects me, in a visual way, to God. 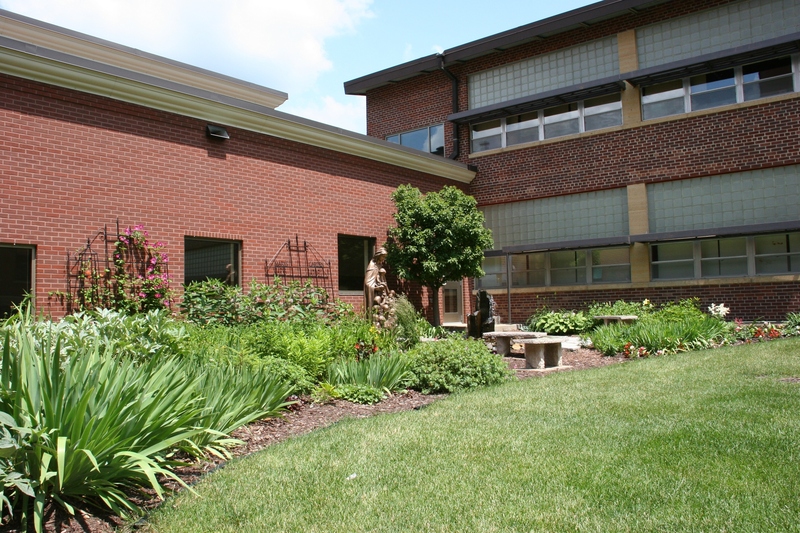 An overview of Mary’s Garden, located between church and school. 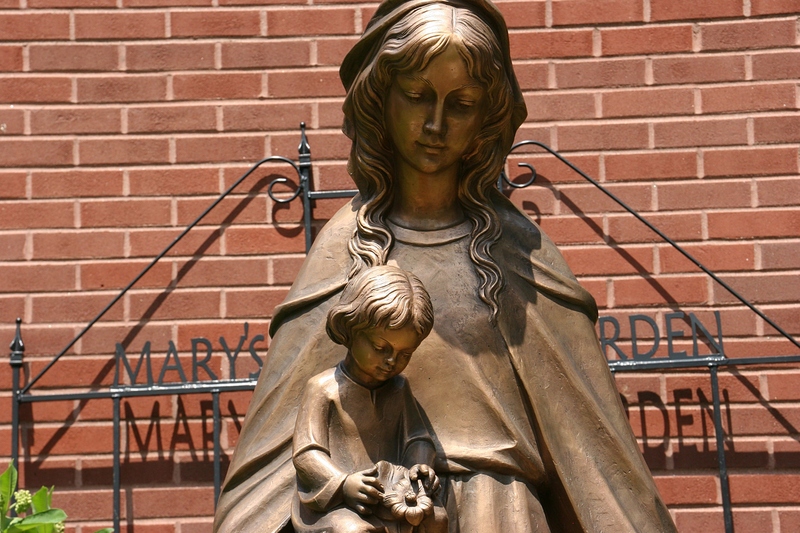 Children surround the statue of Mary in the garden. 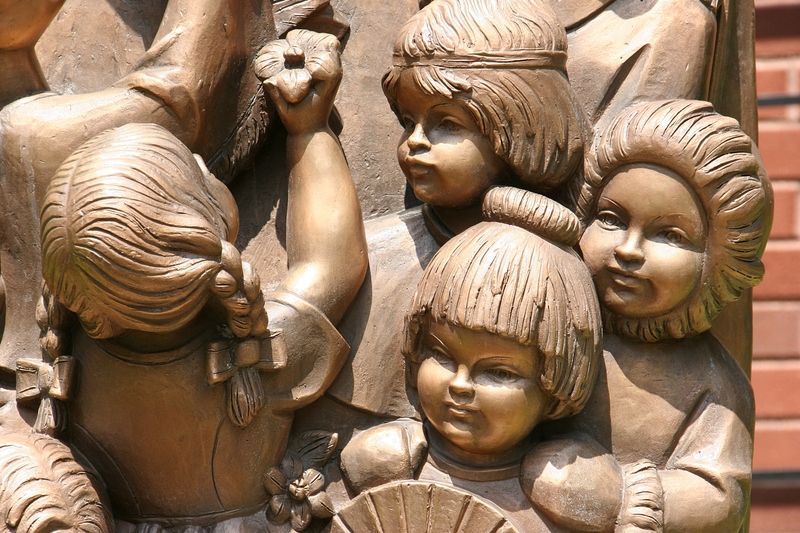 Children of many ethnicities are part of the Mary statue. 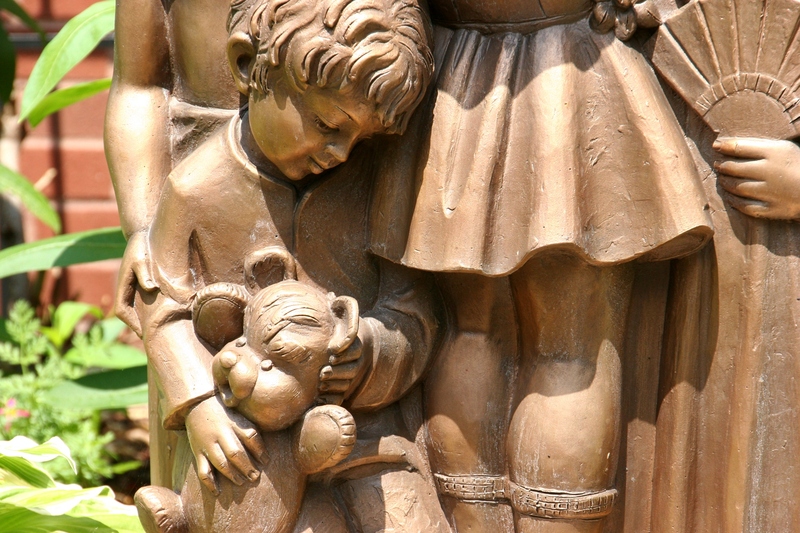 More details in the garden statue art. 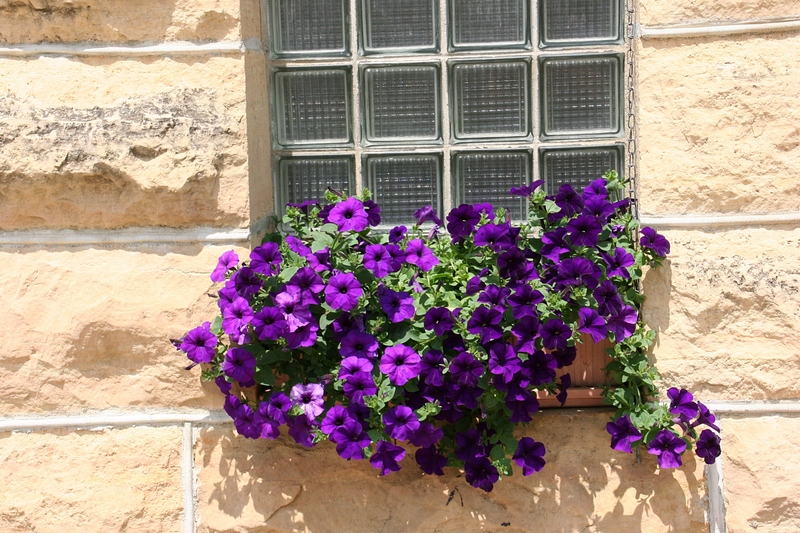 Petunias spill from a windowbox at the front of the school.